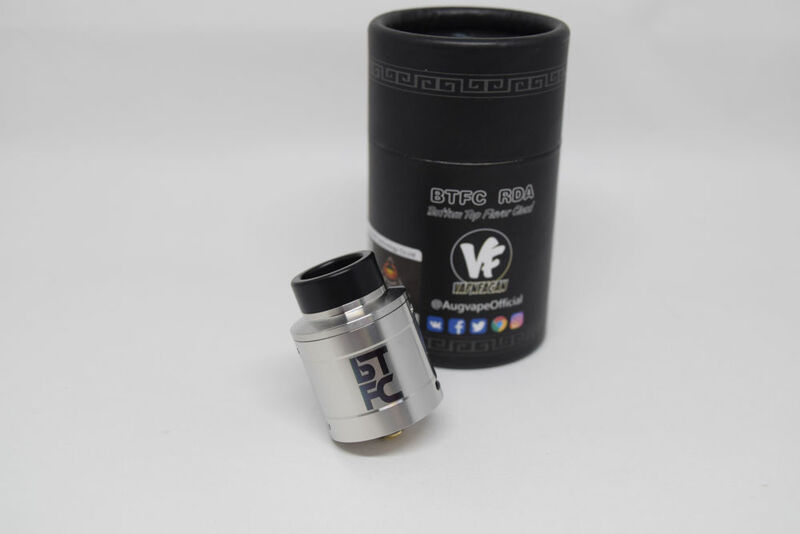 Get a great price on the Augvape BTFC RDA from Vapor DNA. 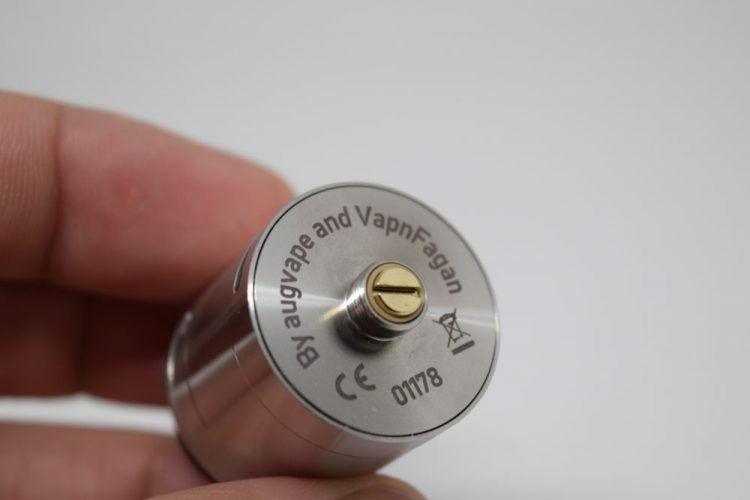 The BTFC RDA comes in the usual Augvape packaging – a small, cylindrical cardboard box, with the company logo, BTFC name and VapnFagan’s logo on one side, and company information as well as a scratch and check authenticity sticker on the other side. Inside this cardboard cylinder we have the BTFC RDA sitting snug in a Styrofoam holder and if you take that out you can find a small plastic bag full of accessories at the bottom of the box. There you’ll find a bunch of replacement o-rings, spare grub screws for the build deck, an Allen key and a hollow 510 pin for squonking. 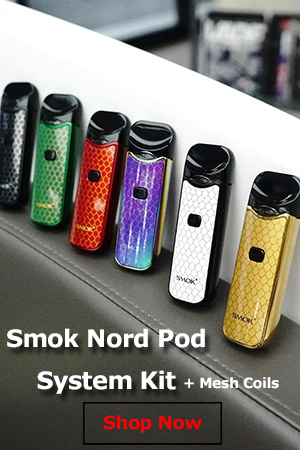 I understand that Augvape wants to stand out from most of the other manufacturers by using these cylindrical boxes, but they should really make them easier to use. For example, that accessories bag at the bottom is really hard to reach, especially if you have fat, stubby fingers, so maybe make the box accessible from both the top and the bottom? I don’t know, but they should really think about some improvements. 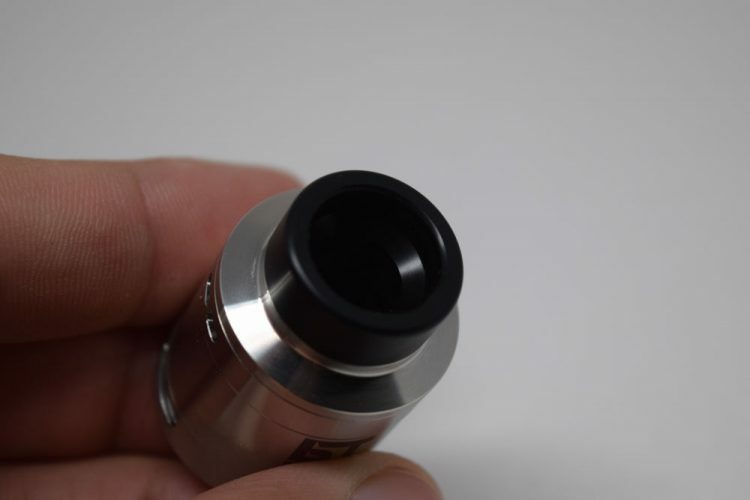 The Augvape BTFC RDA measures 25mm in diameter and 33mm from the bottom to the drip tip, is made primarily of stainless steel, and feels very heavy in the hand, both because of the thick barrel and the beefy build posts. You can currently find it in black, stainless steel, grey and rainbow. 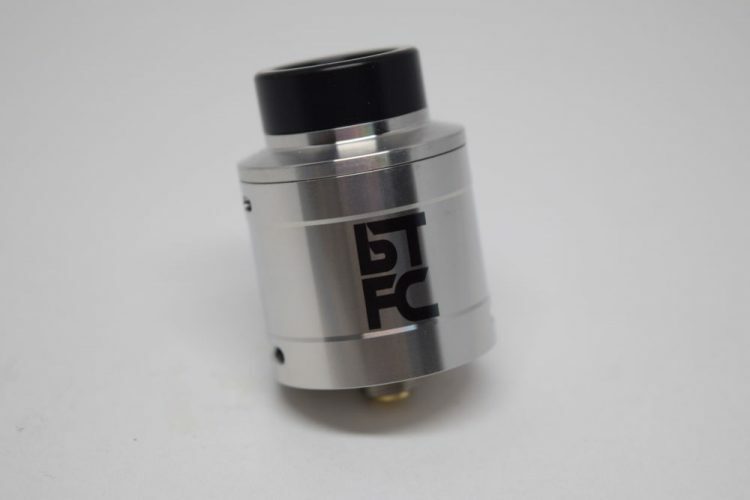 On the outside, the BTFC RDA doesn’t really look very impressive, Yes it has it has the “BTFC” logo etched on one side, but I’m more into discrete branding, so I don’t find that very impressive. At the top, we have a low-profile black Delrin drip-tip kept in place by an o-ring built into the removable top cap of the atomizer. The top cap can be rotated to adjust the top airflow which comes through two medium size holes on opposite sides. On the inside, the top cap is only slightly rounded to improve the flavor. 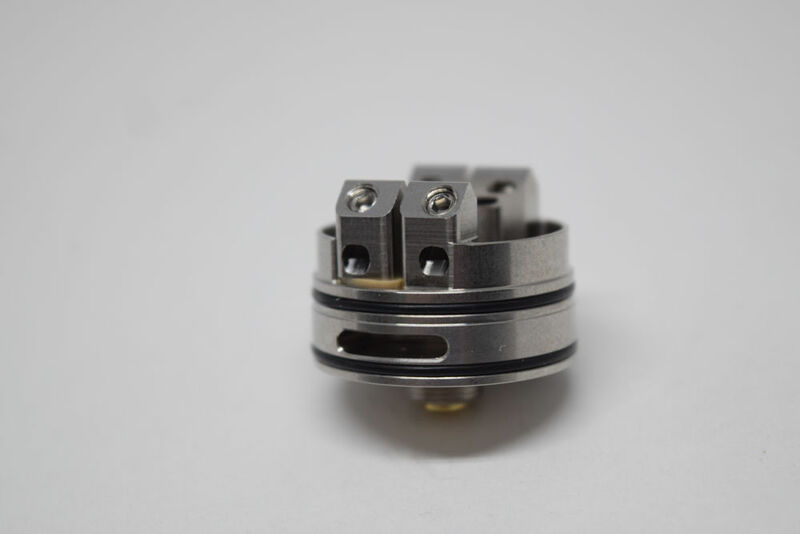 Apart from the obvious branding and the two airflow holes on the bottom, the barrel of the BTFC RDA isn’t anything special. It’s slightly thicker at the top, which probably adds to the overall weight of the atomizer, but that’s about all I can say about it. At the base, we have an adjustable, gold-plated 510 pin which can be replaced with the hollow pin included in the kit. 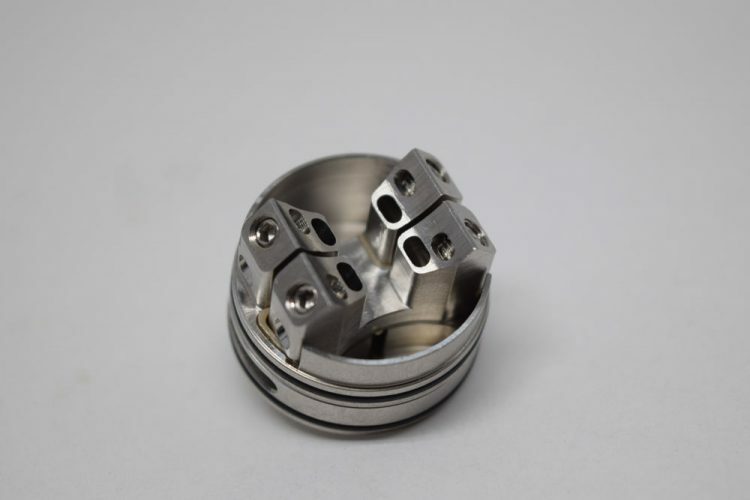 While on the outside the BTFC RDA may not be anything to write home about, the build deck really looks very impressive, primarily because of the four beefy posts which double as air channels for the bottom airflow. It features one positive and one negative post on each side, so you can easily use it in both dual-coil or single-coil mode. 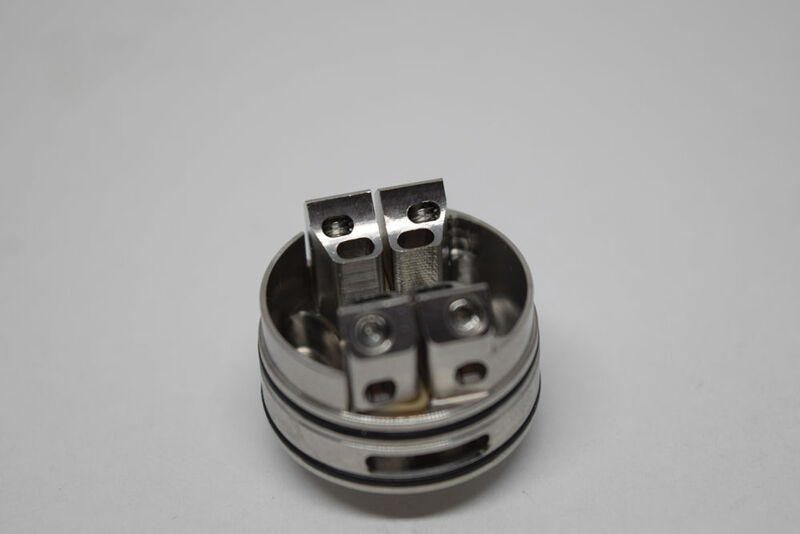 All you have to pay attention to is aligning the coil(s) in such a way that the bottom airflow hits it/them directly. 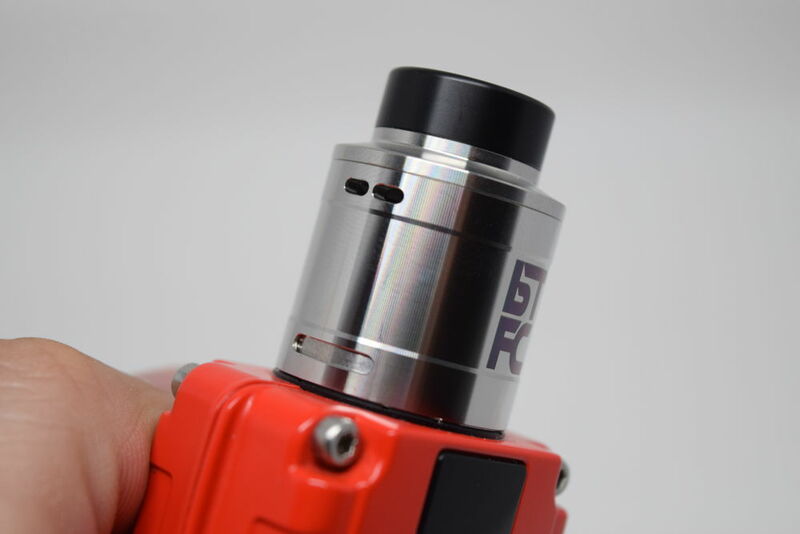 The Augvape BTFC RDA has a very deep juice well, but it kind of creates the illusion that it can hold a lot of e-liquid. In reality, the four build posts take up so much space that they only leave a little space for the wicking and the juice, so the designers had no choice but to make it deeper. I’m not saying that it doesn’t hold enough juice, it does, but it just looks a lot more spacious than it really is. Installing one or two coils on this build deck is a fairly simple affair, especially if you have some experience. All you need to do is loosen the grub screws at the top of the posts using the Allen key, slip the leads into their allotted slots, while keeping in mind that the two pairs of posts facing each other are positive-negative. One of the cool things about how these build posts are designed is that you can leave your coil leads as long as you like, as the excess comes out in the back of the posts and you can snip them with your wire cutters, Do make sure that the leads don’t stick out too much as they may end up touching the barrel of the RDA and cause a short circuit. When installing coils on the BTFC RDA, keep an eye on the slightly slanted holes right under the coil lead slots. These are actually the bottom airflow holes. Air comes through the two slots on the side of the RDA, goes in through the build posts and comes out through those slanted slots. So you want your coils to be aligned in such a way that the air hits them directly. What I like about this design is that it’s hard for e-liquid to leak through the bottom airflow slots because they are located so high up. 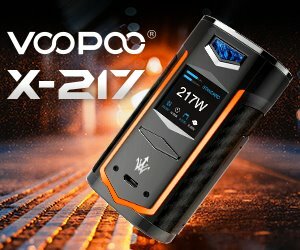 I for one like the idea of having both bottom and top airflow, but I do feel that Augvape and VapnFagan could have done a better job designing the airflow consideration. If you want to use the BTFC with both bottom and top airflow open, that’s fine, although that’s too airy a vape for my taste. If you only vape on it with the bottom airflow open, that’s fine too, as you can easily close the top airflow by turning the top cap, but if you want to use the RDA only with side airflow, there’s a problem. The thing is that the bottom airflow slots are cut into the barrel, so you have to turn it to close and open it. 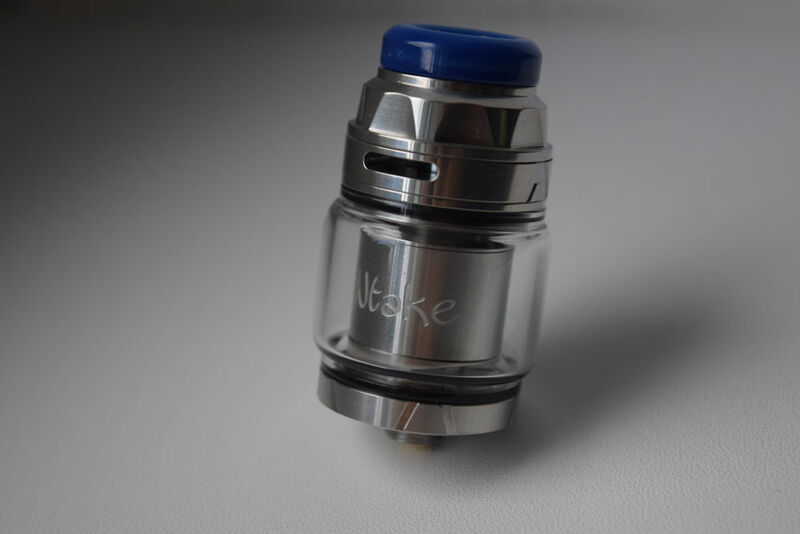 Only when the bottom airflow is closed, the barrel is no longer aligned with the coils, so neither are the top airflow slots. Air will still hit your coils, but from an angle, so it will affect both the flavor and the vapor production. I tried vaping like that for a while, and while the flavor was still pretty good, the vapor production was a lot weaker, plus I started feeling a stronger throat hit even though I was only vaping 2% nicotine e-liquid. Unfortunately, there’s no way to fix this top airflow issue, but, on the bright side, bottom airflow is much better in my opinion anyway, especially when it comes to vapor. Still, this is a considerable con. 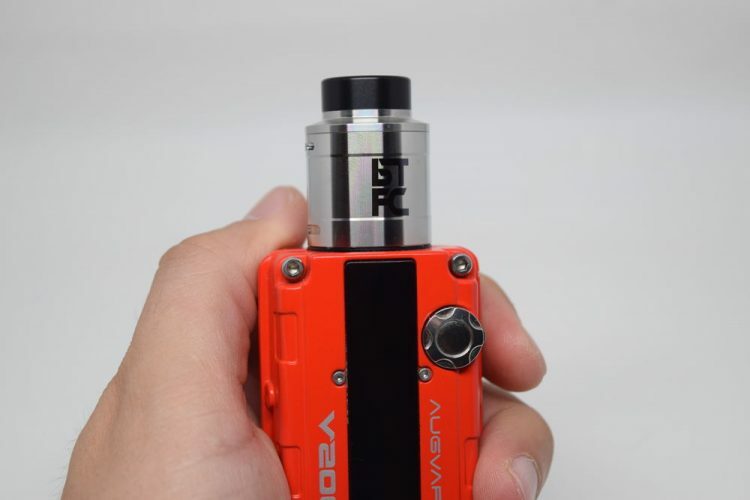 All in all, the Augvape BTFC is true to its name – it does have bottom and top airflow and offers both great flavor and clouds of vapor (depending on your build, obviously), but it’s definitely not perfect. 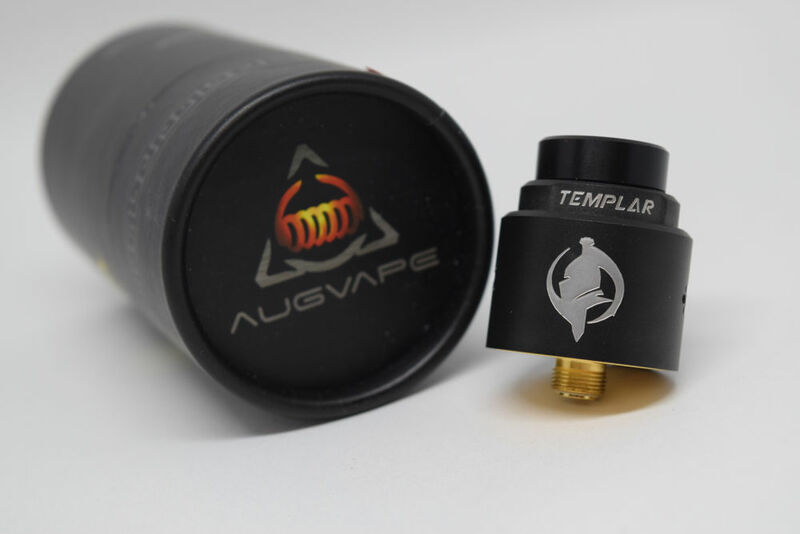 Using the top airflow by itself doesn’t yield the best results due to the alignment with the coils, and it doesn’t really bring anything new to the table. 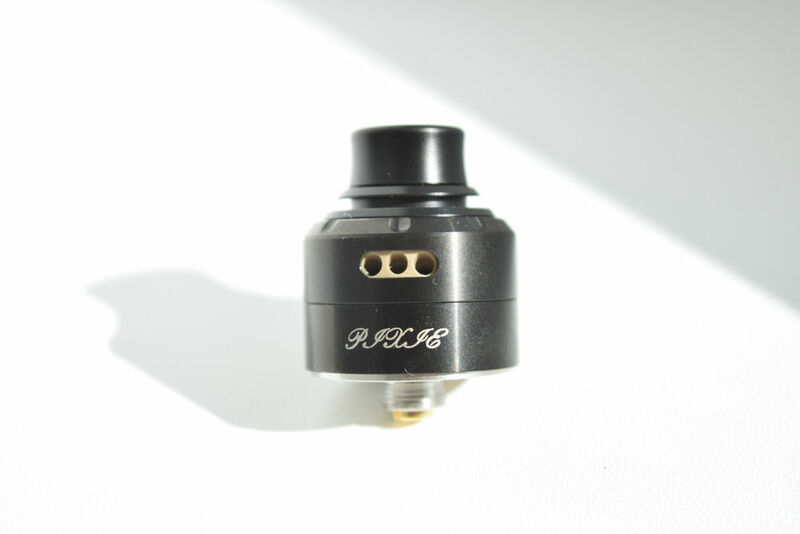 Still, it’s a nice RDA to add to your connection, especially if your a fan of Fagan’s or if you’re in the market for a 25mm. The Augvape BTFC RDA was sent to me by Augvape for the purpose of this review.